You are watching aviation history. 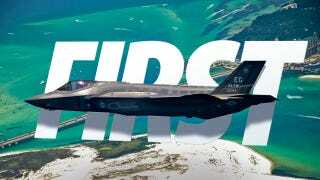 This is the first U.S. Air Force F-35 Lightning II ever, the first step towards a new fleet full of stealth strike fighters. It's fully operative and combat ready. The image gallery is bee-ooh-tee-ful.